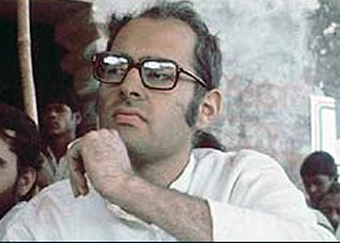 Sanjay Gandhi (14 December 1946 – 23 June 1980). The younger son of Prime Minister Indira Gandhi and Feroze Gandhi, he was a member of the Nehru-Gandhi family.. Wallpaper and background images in the मशहूर हस्तियों जो जवान मारे गए club tagged: celebrities who died young. The younger son of Prime Minister Indira Gandhi and Feroze Gandhi, he was a member of the Nehru-Gandhi family. This मशहूर हस्तियों जो जवान मारे गए photo might contain सड़क, शहर के दृश्य, शहरी सेटिंग, शहर दृश्य, and शहरी की स्थापना.